M6UCW. What gives you the right to describe people who have no interest in using boring computers with their radio as "illiterate" ? No interest does not mean no knowledge. If you must know I only log a few calls on QRZ but all calls are in the paper log. You clearly dislike radio amateurs of the older generation. Instead of insulting us with comments like "illiterate" perhaps you should xxxx off and join a computer or mobile phone site. You refer to a limited number of the older generation who had the future of technology at heart whilst many shied away from progress. What I say is from experience - having known zero about the hobby it's been rather a long and sometimes frightening journey to obtain the information I require. Not all clubs have websites, not all those that do are up to date (some even not updated within the past years) and some who have high tech members really slow. And when it comes to "killing the hobby", yes I may not be that technical literate however are all hams that technical literate? Does everything have to be done from scratch? Smartphones for instance never was new technology - it was the combination of many other ideas into a single package and so it continued with the addition of the MP3 player, video recorder, camera.....and so forth. People now dabble with current radio technology to get it to work for amateur use both in the operational and technical front. Even now, home brew repeaters are being added, people like M0JFP dabbling with radios to make them more affordable, hot spots available for those not near a repeater or unable to put up an antenna. Maybe the next generations will look DMR and think of a new technology to add based on the ideas that are currently being worked on. Let me remind you that we do not all join the hobby for the technical aspects and as long as we enjoy the hobby within the limitations of our licence, then we should be left to do. You may wish to read my post again as it does not it does not state that people with no interest are illiterate. As for boring computers, As M0LSX pointed out, there has been a collaboration between computer and radio technologies for years. Thus needing a computer to program a DMR radio would not be the first instance that a computer is to be used in the hobby. One major issue is that many wont even learn how to upload / download code plugs thus trying to provide assistance over the radio or via phone is rather difficult. As for my dislike for the older generation amateur - I do not dislike them all - I dislike those that think that everyone in the hobby should be the same - work HF, get into contests, talk about the same cr@p all the time and so forth. Maybe it's due to what I have experienced - sometimes making me wonder why any young person would want to get into this hobby unless they were a technical geek. At the end of the day it's a hobby and we will all enjoy it in our own way so if M0JFP and company wish to dabble with radios then let them do so without criticism as they are not harming anyone. M6UCW wrote: You refer to a limited number of the older generation who had the future of technology at heart whilst many shied away from progress. .
You are very very wrong. When the original B licensees were limited to VHF & UHF it was of no commercial use. Those amateurs pioneered the use of VHF & UHF. Maybe only a minority played with computers, but there is more to technology & progress than computers. Those you seek to condemn created the repeater network you are happy to use. They created moon bounce & developed antennas among other things. The slim Jim antenna is a good example. It was designed by G2BCX, Fred Judd. As was the ZL special. Both have changed the face of VHF & UHF operation. Fred was a prolific writer of article & the Practical Wireless antenna publication Out of Thin Air is full of Fred's articles. Les Moxon G6XN was one of the first licensed radio amateurs in the UK, gaining his licence in 1928. Again Fred was a antenna designer & designed among other antennas guess what?? Yes the Moxon. As an M6 you owe a big thank you to the Rev George Dobb's, because without his dedication to QRP operating, you would probably be a lot worse off on your 10 watts than you are. The 1960's offshore era & thus the UK's current radio broadcast system, owes a big debt to radio amateurs too. Because with out radio amateurs building & maintaining the transmitters, many stations would not have made it too air & without them, the goverment would not have had to open up broadcasting. Ever heard of a cubical quad antenna? That was designed by Clarence Moore, W9LZX for HCJB in Ecuador. The old antenna was literally melting due to Corona discharge at its tips caused by the high altitude & moist climate. What about microphones?? Ever heard of Bob Heil K9EID? He started by designing pipe organs, before moving onto to rock music sound systems with the likes of the Grateful Dead & the Who among others. And what about the various RSGB committees, who do you think their experts on propagation, interference & a raft of other specialist areas are?? I'll give you a clue, few hold a callsign with M at the front. What has been offered to amateur radio & technology advancement as a whole has been vast & computers are not the limit of technology. A website is simply one method of having a portal into the outer world. Designing & managing a website is neither technically advanced nor evidence of someone's computer or technical literacy. To give you a list of a few well know radio amateurs & the depth of the technology covered. W1GBE, Percy Spencer. Inventor of the Microwave Oven. K1OKI, Mickey Schulhof. Head of Sony US. J3BB, Masaru Ibuka. Founder of Sony. JP1DPJ, Akio Morita. Founder of Sony. JK1SIU, Norio Ohga. Chairman of Sony. K2HEP, John Sculley. former CEO of Apple Computers. NE2Q, Jay Kolinsky. Invented & manufactured the Electronic Sirens used on burglar and fire alarm systems. KB6OLJ, Paul J. Cohen. Mathematician. W7DUK, Nolan Bushnell. Inventor, Computer Pioneer, Founded Atari. There's no need for this. We have different viewpoints. No attempt at convincing anyone else is going to work, so can we just cool down and consider that everyone has an opinion. Lots of things about the hobby in it's current state annoy me. It really doesn't matter. The Chertsey radio club no doubt have many members who want to experiment with radios, and they're trying to find a way to make it cheaper and easier to do it. They've decided digital is the way forward for this particular project. Some of us think this is good, others think it bad. Can we just talk about it, and not let it get personal. DMR may be all very well, you buy a radio download a codeplug (or buy one ready programmed) and start transmitting, yippee I can talk all over the world and because I use the internet to do it I don't have to learn about boring things. Things like how propogation works, how an antenna works, what the hell is longpath? and greyline? I personally think that this leads to laziness and it takes away any incentive or need for an M6 to progress any further as they now have it all on a plate. Not only do they now have all the bands to work, but 10w is now more than enough to guarantee dx (via internet) indeed 500Mw is enough to open a repeater. I would remind people that a major tenet of amateur radio is " self teaching in radio communication" sadly this seems to be blowing away in the digital breeze. Not everyone will agree with me, but opinions are like assholes everybody has one, this just happens to be mine. * I can work the world from a handheld - from a G0 station who has held some (and still does for some of them) senior positions in his local club, the RSGB and Raynet. Remember as well that not everyone can use HF - my DMR mentor has several mag mounts on his gutter on the balcony - unable to get much else done even inside as the structure is like a fort. I have heard several stations in London say the same as all they can do is put up something small on a balcony or windowsill without upsetting their neighbours. Remember that the hobby is in fact dying if you look at the Ofcom licence stats - you have to adapt to what the new generations will get hooked onto then do not force feed HF, propagation, contests etc down their throats as it will put them off - just as it has done for me. A mix of old and new is needed to grab their attention. HF is not everyone's "cup of tea" so best some get over it - catch the fish first before you plan how to cook it. I don;t mind people being passionate about what they believe in - but personal attacks and bad language allow people to form opinions of individuals. I've now got mine. Actually - using a handheld to travel a mile or two to a repeater to connect with somebody on the other side of the world in real time really IS amateur radio. Despite the wires, the fibre and the complexity of node to node comms, it's damn clever. In virtually every field of professional communications radio is only part of it. My work involves radio. Short range systems in mono and stereo. Lots of parallel channels. Plenty of scope for intermod, lots of aerial combiners and splitters - computer monitoring - it gets very complex. My ham radio skills are damn useful. My hobby assists my work. Not bad I think. The fact that much of my work is now sent down cat 5 doesn't denigrate the radio side of things. What I don't get in the outburst above is what the issue is. If you don't want to use digital amateur radio, then don't. Work foreign countries on HF, maybe low power and small antennas too. Possibly consider CW. It's a choice. Banging on about one type of amateur radio being somehow less worthy is stupid. Ever since we've had repeaters we had a few people who would want to swap QSL card. Usually with comments and chuckles from those more worthy. I used to join them, but then realised that collecting QSL cards is a hobby in itself. The quest is to talk to strangers, efficiently and reliably. In contests is anyone ever anything other than 5-9 thanks for the call CQ. The aim is collecting, not quality or skill. For many contesters in the US, a mega tall tower - huge beam and maximum power guarantee good results. If we are talking skill, then the person with the skilled ears and persistence could be considered the 'true' amateur, not the size of your wallet. Hams have always liked gadgets. The CW fanatics decry the people who use high speed autokeyers. HF USB is somehow better than using 145.550 to have a chat about fishing? What is very clear is that business appreciates the small number of amateur pioneers. BT's labs near me in Suffolk have plenty of hams on the technical staff. Quite a few science and maths teachers are hams. BBC and ITV's technical departments have them. Maybe a huge proportion of everyday hams are just the same as CB enthusiasts and PMR446 addicts. So what! There will always be a few who have seriously advanced skills. The Government sell off chunks of spectrum to make money. The more amateur we have using the bands the better - worldwide. Use it or lose it. If digital connects countries that's good. It's not for me. I have the equipment but no interest. I'm more interested in low power reliable comms, and that is what I experiment with. I monitor signal paths and compare them with the topographic software - keeps me active. 20 years ago it was military airband. Mick had a very personal take on what amateur radio is. The truth is that it is whatever it is on a certain date. Next year it will be different. The idea as I get it is that being a ham means you constantly learn things. That is all. It is also a two way radio thing. You can't be a ham without somebody else being involved- it takes two or more. Being an angry person with a huge chip on the shoulder about nothing at all doesn't help. He has gone now. He didn't like us very much, so I hope he finds a place he can inhabit that cheers him up a bit. M6UFC Sorry if you thought I was having a pop at you and M6's in general, nothing could be further from my mind. Being an RSGB tutor I always support foundation holders and have had many a rant at G or M whatevers when they have had a whinge. It was about the system in general and problems with DMR. Hope that clears it up. Darkstar wrote: M6UFC Sorry if you thought I was having a pop at you and M6's in general, nothing could be further from my mind. Being an RSGB tutor I always support foundation holders and have had many a rant at G or M whatevers when they have had a whinge. It was about the system in general and problems with DMR. Hope that clears it up. No worries - there was nothing to get upset about anyway - I was just making a point between an M6 and the G4 / G6 stations (one of which is a member of the forum). Personally, I was taught about DMR and code plugs by a a G6 who is retired - he doesn't use HF and I I think he has one analogue radio (but at least half a dozen DMR radios) - has only mag mounts on the balcony gutter but enjoys radio both as an amateur and listener (DMR got him back onto the radio). It's all radios and computers for him - hot spots, DMR, analogue, SDR..... most of the day he spends listening to the radio. Now the G4 is another story - retired and was a HF nut - worked all bands and most of the world - would never miss a day but then conditions and noise levels with space limitations for antennas made it too difficult - he's now enjoying DMR, D-Star, Echolink and Fusion as an alternative - still has the HF rigs. Digital modes are also making it easier to stay connected on the move or when away - roaming, personal hotspots - all keep us in touch with the regulars. Just shows that amateurs of all ages and abilities can find their little bit of happiness with something in the hobby even if it includes the internet and a hotspot (Who would have thought of internet linking in amateur radio when we still had the old 14 400 and 28 800 dial up modems?). With the bit of time I get on the radio and most being mobile, DMR is easier with roaming and being able to chat to various people in the region but usually via several different repeaters as we may not all be able to get into a common repeater. 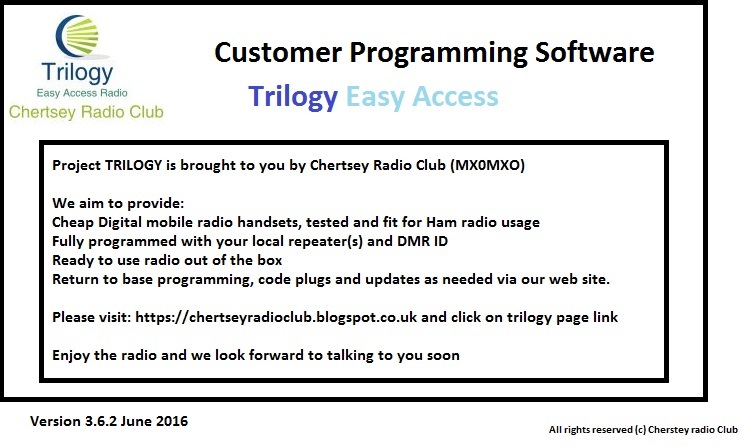 Just to let you know the customer programming software was released back to us today after heavy customisation to make it more ham radio focused. This week we are working on the user manuals and will share them out once we have finished them.